THE first artist impressions of a $43 million riverside upgrade have been released as part of a bold plan to transform Brisbane’s waterway into a gateway to Moreton Bay. Brisbane City Council will release designs today for two new docking hubs outside the Powerhouse at New Farm and the City Botanic Gardens at the end of Alice St. It is the first step in opening up direct trips from Brisbane to the Moreton Bay islands in what is hoped will be a boon for hop-on, hop-off sightseeing tours. The moorings will be the first of 10 new sites, including five inner-city locations, that were heralded as a flagship item of council’s Budget this year. All up the docking hubs will cost $18 million. Lord Mayor Graham Quirk said the plan was about enhancing further tourism and recreational opportunities, including kayaking or paddle boarding, along the city’s river. “New Farm Park and the City Botanic Gardens are two of the five inner-city docking sites that will be built, followed by West End and two riverfront locations at South Bank,” Cr Quirk said. The pontoon jetties will include several symmetrical fingers for smaller vessels to dock, with a larger area out front for bigger boats. 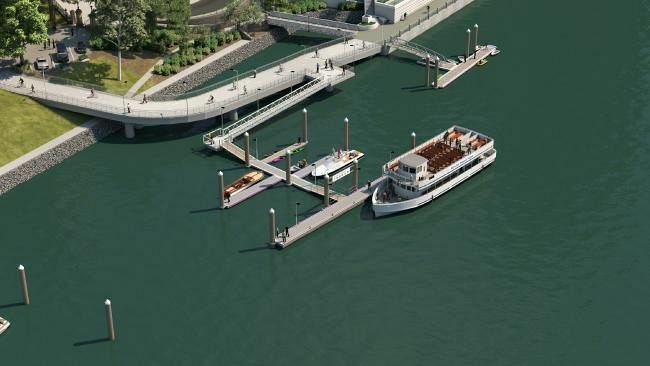 Up to 15 vessels, from canoes to water taxis, will be able to be supported at each of the docking hubs.